Through my series, ‘Ike Ho‘omaopopo (Consciousness), I, Shari Kaleohoneakekahuli Martens Magno, am challenging Hawaiians to know your identity –to know your roots, to remember your history. There is an important message in the first of the series, Mai Po‘ina ‘Oe Ia‘u (Remember me), but its disclosure is not for everyone. For the intended, the symbolism and significance need little explanation. In this painting, I depict a stack of faded portraits draped in dry and brittle maile to represent the past and the generations of ali‘i long gone. 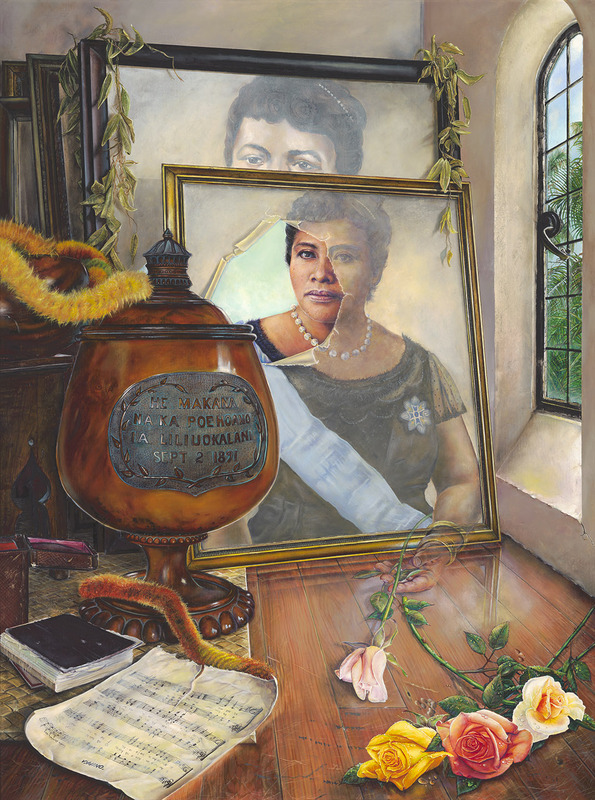 The portrait of Queen Lili‘oukalani sits amid a collection of her effects. The film of time is peeled back from the face of Hawaii’s last reigning monarch and her eyes (which follow the viewer anywhere no matter where he or she stands) are full of love and compassion. Her hand reaches out from the frame around the image of the painting and extends toward the flowers on the floor in front of it… her pua...her people.